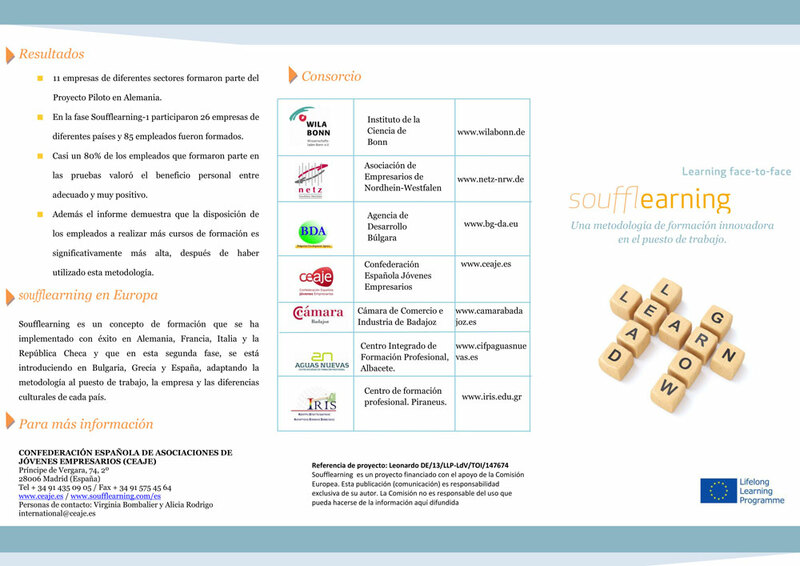 During the course of the project our partner organizations have invested much time and effort to promote the Soufflearning method in their respective regions. In order to do so, a lot of excellent promotion and dissemination material has been produced. In this post we wanted to highlight a few of them. We hope you enjoy the examples below as much as we do and that they help you learn a bit more about Soufflearning. For the Spanish-speaking readers, our partner in Badajoz has put together this seven-page booklet. It introduces Soufflearning and shows how the training method can help businesses introduce work-based learning into the workplace. It is very nicely designed and pleasant to read. To download the entire booklet, simply click here. Another Spanish entry comes from the Confederación Española Jóvenes Empresarios. 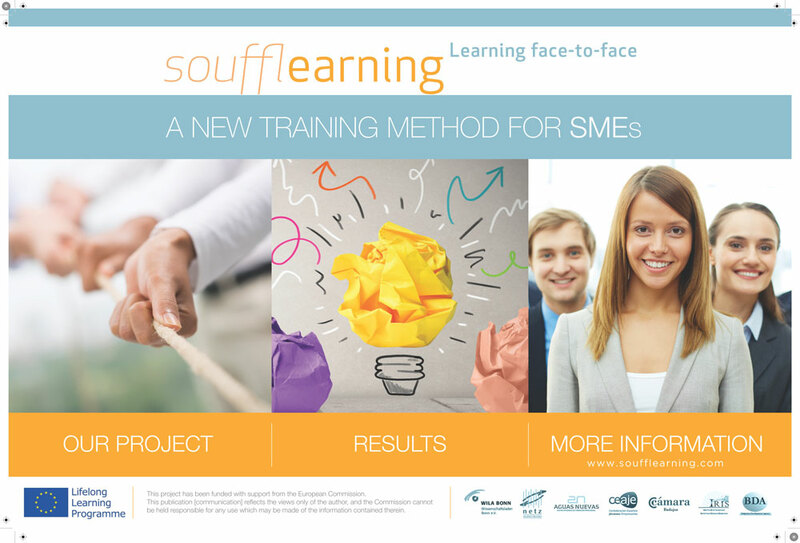 This three-fold leaflet was made in the first phase of the project to explain Soufflearning to interested parties. For a full PDF version, please click here. Our coordinator at Bonn Science Shop also wasn’t idle. For the 2013-2015 project, they produced and updated poster that has been used in workshops allover Europe. Nice and clean design. A printable file can be found here. 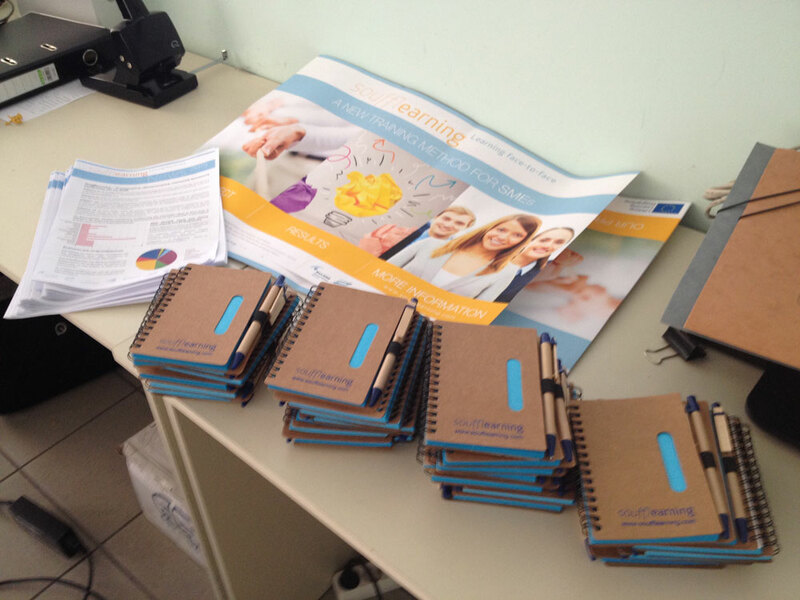 Here you can see the Soufflearning-themed notebooks our Greek partner VET Centre IRIS was handing out at their workshops. After this image appeared on the website, other partners eagerly inquired if they could also somehow get their hands on the Soufflearning stationary. Since unfortunately they can not be downloaded, you will have admire them from afar. Besides the locally-produced dissemination tools, additional promotion material can be found here on the website. The 2015 Soufflearning newsletter is one such example. Interested readers can find more information about how the project has progressed throughout the last two years and learn about results from all partners. You can click on the image above to download the English version in PDF form. Other languages as well as the first project newsletter from 2014 can be found on our download page. As you can see, the promotion material for Soufflearning is just as diverse as the areas of training where the method is employed. The results has been very satisfying as each partner did their best to adjust their approach to their local environment and target groups. We hope you liked it! Additionally, should you have any questions about the project or would like to know more about Soufflearning, please don’t hesitate to contact us. We would love to hear from you.